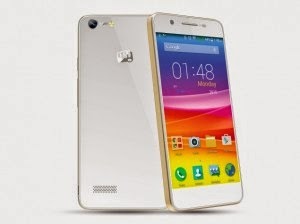 Micromax has launched its new Canvas-series smartphone, the Canvas Hue, priced at Rs. 10,999. The smartphone will be available starting Friday this week from online and offline stores across India. One of the most notable features of the Micromax Canvas Hue is that it packs a large 3000mAh battery, which the company claims can deliver battery back-up of up to 30-days with the handset’s super power saving mode. The Android 4.4.2 KitKat-based Canvas Hue supports dual-SIM (GSM+GSM). The company has announced that the smartphone is upgradable to Android 5.0 Lollipop via FOTA (firmware over-the-air); though it has not revealed an exact release date for the update. The Canvas Hue features a 5-inch (720×1280 pixels) HD AMOLED display with scratch resistant Corning Gorilla Glass 3 protection. It is powered by a 1.3GHz quad-core processor that’s coupled with a Mali 450 GPU and 1GB of RAM. The Micromax Canvas Hue bears 8GB of built-in storage that can be expanded via microSD card (up to 32GB). It features an 8-megapixel autofocus rear camera with Sony Exmor RS sensor, and LED flash, while also housing a 2-megapixel fixed-focus front camera. Connectivity options on the Canvas Hue include 3G, Wi-Fi 802.11 b/g/n, Micro-USB, A-GPS, 3.5mm audio jack, and FM radio. It is available in Gold and White colours.